Bodega Biarritz 1881 is a tiny tapas place with a reputation for great food and service. If you don’t mind a distinctly cosy setting (and probably a wait), the tapas here are a treat. Bodega Biarritz is conveniently located in one of Barcelona’s most popular tourist areas. Close to the Plaça Reial, and a stone’s throw from Las Ramblas, this little restaurant sits in the city’s Barri Gòtic (Gothic Quarter) – an attractive jumble of narrow streets crammed with shops, bars and eating places. What’s on offer at Bodega Biarritz are tapas. A lot of tapas. There are around 30 to choose from, and the selection includes everything you’d expect to see on a traditional tapas menu. There are oodles of potato and cheese tapas, meat dishes, and some vegetarian options rounding out the choices. Actually, a word about the cheese: these restauranteurs love their cheese and it can be found in many of their dishes. They aren’t mean with the amounts served, either. Cheese-lovers will be in heaven, but dairy-intolerant visitors might be better served elsewhere. If the menu has few surprises, it is all very nicely done. The consensus from visitors is that the food here is plentiful, tasty and hot — and that’s enough to keep the queues forming. Perceptions of the Bodega Biarritz’s ambience may depend on your need for personal space! The restaurant has a very small footprint, and probably accommodates no more than 20 diners at a sitting. You’re going to be up close and personal with your fellow diners. The tables against the wall are particularly tiny. Some visitors won’t enjoy this, especially when the temperatures start to climb. But for others, it’s all part of the fun – the small space makes for a lively and, dare we say, authentic atmosphere. A meal at the Bodega Biarritz is not going to break the bank. Most of the tapas are between €2 and €4, and the tasting menu for two — a generous eight tapas dishes – will set you back about €28. In addition, if you receive a tapa that you don’t fancy, the staff will substitute another, free of charge. Drinks come in at €3 for the house Rioja and €3.5 for Sangria. In our book, that all adds up to excellent value for money. The service at Bodega Biarritz is another big draw, as the staff here are helpful, attentive and friendly. They also speak excellent English. They do a great job at explaining the ordering system (there’s no written menu, so you have to point out what dishes you want) and making recommendations to customers. Many of the serving staff are also involved in preparing the tapas, and maybe it’s that extra level of investment which shows in their positive attitude. 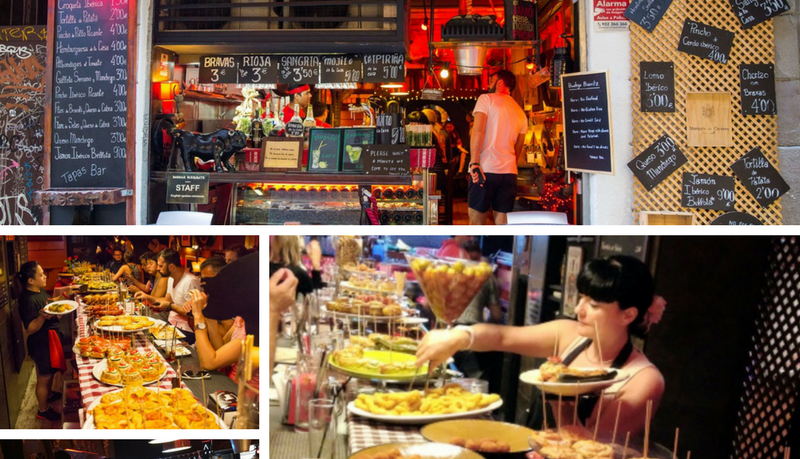 In Barcelona, you can hardly walk 100m in Barcelona without falling over a tapas joint. There are hundreds, and they’re in every district. So, when a tapas place gains a 13th place ranking on the mighty TripAdvisor, you know they’re doing something right. That’s what Bodega Biarritz 1881 has achieved, through a winning combination of food, service, value and ambience. Bodega Biarritz is located at Calle Vidre, 8, 08002 Barcelona, Spain. The restaurant is open 17:00hr and 23:00hr, every day but Tuesday. You can’t book a table at the Bodega Biarritz, and it’s a popular place – that combination means that you’re probably going to have to queue. It’s not necessarily a problem, though: once you’re inside, just have a glass of Rioja while you wait and soak up the atmosphere. If you really can’t stand queueing, your best bet is, as usual, to show up earlier in the evening. Despite the small dimensions, the Bodega Biarritz is a restaurant, so you can’t just order drinks. Lastly, it’s also worth knowing that it’s cash only, so don’t caught out!